The Oppo F19 Pro could bring with it a very cool feature that means it gets an edge-to-edge screen and a well disguised punch-hole front-facing selfie camera. Watch out Samsung Galaxy S10. Chinese manufacturer Oppo has continually innovated with each of its new phone releases, a recent win being the Oppo Find X. This was made famous by its all screen display. Thanks to a pop-up selfie camera the Find X features a completely bezel free display with no camera to mess up the finish. It's the display that everyone always wanted. Yet the competition is expected to increase sales of punch-hole screens, with the camera in the corner of the display. The Samsung Galaxy A8, for example, offers this style of display. So it looks like Oppo has plans to do the same. This would allow it to make the phone smaller by placing the selfie snapper on the screen. A bit of a step backwards from a camera-free screen but perhaps this could cater to tighter budgets. 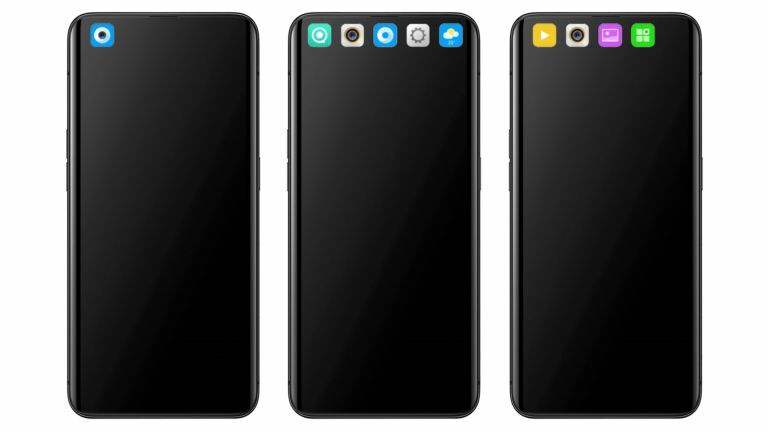 The patent documents describing the potential Oppo F19 Pro were found by LetsGoDigital which mocked up the above image. The clever thing here is the phone's ability to place the camera icon around the selfie lens. This makes it look like the camera isn't even there breaking up the screen, to give the appearance of an all-screen display. The Oppo F19 Pro is also rumoured to feature a 10x optical zoom camera and could be announced at MWC 2019 in February.